Two months after the introduction of the latest jet trainer at the rollout ceremony on October 12, the first L-39NG proved its readiness to flight and to start certification tests. The aircraft has flown in a configuration that is representative of serial aircraft including final upgraded wet wing and air inlets. This step forward consolidates even much further Aero goal to achieve type certification by the end of 2019. 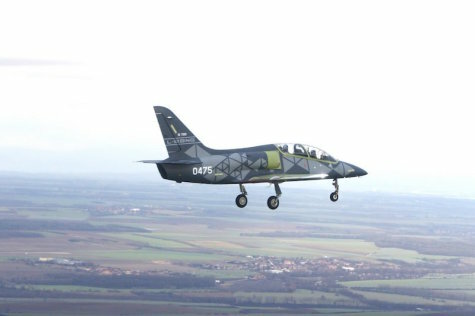 The L-39NG is a single-engine two-seater with staggered seating and an advanced cockpit design that includes full glass cockpit, a sophisticated, on-board virtual training system and a Helmet Mounted Display. The L-39NG is a key component of an innovative training concept developed by Aero that includes state-of-the-art ground-based training facilities, new learning methods and environment and extensive use of Virtual Reality and Artificial Intelligence technologies. The L-39NG has been designed as a maintenance-friendly aircraft for many decades of reliable service. Those capabilities enable the L-39NG to be the only available platform on the market capable of performing basic, advanced and LIFT/OCU training at the cost of a turboprop. “The L-39NG performed extremely well and fully met our expectations in terms of stability and controllability. We could even perform some tests like configuration changes, acceleration up to 200 knots, turns to 30, 45, and 60 degrees and slow down to approach speed. All installed systems worked perfectly and outlook outside the cockpit was excellent. The L-39NG is a completely new aircraft and I believe, it has great potential to become a perfect trainer for the 4th and 5th generation fighters as well as a light attack platform,” said David Jahoda, Aero Test Pilot. The aircraft's avionics are prepared to train future pilots of 4th and 5th generation aircraft and can be tailored to the customer's requirements. The L-39NG is equipped with five hard-points for weapons. The aircraft also features a broad range of simulation technologies, including the integration into high-tech tactical simulation centres with the goal to increase training efficiency. Strategic partner of the L-39NG project is Czech company Omnipol. With a huge existing fleet of L-39 and with a brand-new aircraft, L-39NG, Aero is positioning itself as a leader in the jet training market. In the field of civil aviation, Aero partners with many of the world's largest manufacturers in a diverse range of projects. More recently, Aero became a full partner in several risk-sharing programs, taking responsibility not only for the production of structures but also for development. Since 1934, OMNIPOL, a.s. has been a reliable global systems integrator and supplier of military, security and aviation systems. In addition to aviation technology and aviation training systems, Omnipol’s primary focus is on defence and security electronics. Omnipol initiated a new phase of its development when it purchased ERA, a.s., creating the conditions for the rapid development of a new generation of unique passive (invisible) tracking and recognition systems called VERA-NG. The system is complemented by other types of passive systems (such as SDD) and thereby offers a comprehensive solution for the monitoring of air, sea and land space on the principle of “seeing without being seen”. Omnipol is also a supplier of technological production units and services for both the defence and food industries.